I’ve recently purchased an Edgerouter PoE from Ubiquiti, which is a great deal regarding its price and performance. The only caveat was related to the lack of native support for load balancing and failover. This lack has been fixed with the release of the 1.4.0 firmware, which embeds a load balancing functionnality with native connection tracking. Let’s also assume your ISP CPEs are configured in bridge mode. To show all the potential of the router, the IP address we’ll get from ISP 1 is dynamic and the one from ISP 2 is static, but both are acquired from ISP’s DHCP server (yes, my ISP are serious people, and they don’t use PPPo[E|A] ^.^). I also use an internal autonomous DNS server to avoid unreachability delays during failover, and to have a trusted DNSSEC anchor. You will find below the schema for this scenario. The fqdn and IP addresses in this scenario have been changed to protect the innocents. To begin with, set up your 3 interfaces on the router, the dhcp on the inside part, and the DNAT rules. Next, we’ll setup the load balancer to use ISP1 as our primary access and ISP2 as our failover access. I decided to change some of the check parameters to show you how powerful the tool is. As we are in a failover setup, I won’t use the weight command, which you would use for load balancing scenarios, to adjust the percentage of traffic you’d like to send to the corresponding interface. As told at the beginning of this article, the load balancer will take care of tracking and marking the connection, to avoid that a current session gets in and out by different IP addresses. This is especially useful if you decide to use SNAT rules. As shown above, I decided to check ISP 1 connectivity against a specific IP address, but by default, the equipment will run the check against « ping.ubnt.com ». RFC1918 networks which we will route through the main routing table. 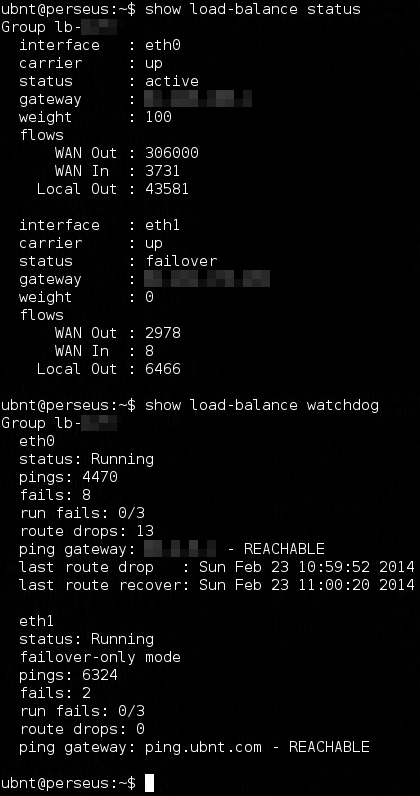 192.0.2.129 which is only reachable via ISP 1 (we’ll set up the target VRF table 10 for this case). 198.51.100.192/28 which is only reachable via ISP 2. (we’ll assume our gateway is 198.51.100.62, and we’ll set up another target VRF table 20 for this case). Edit: ubnt-stig advised me to use a firewall group to define the RFC1918 in the comment, so you will find an updated version below. And finally, you’re done! Your dual wan setup is operationnal. Now you can configure SNAT rules for your publicly available services. If you want to use different a different load balancing policy, create another load-balancer group with the appropriate settings, and add a new rule into the firewall modifier group. Before exiting configuration mode, don’t forget to commit the configuration, and to save the configuration if it fits your requirement. Edit: On the following screenshot, you can see the output of the load-balancer status commands. When I plug a device on my Cisco CPE, I have some issues to get a DHCP lease. Your CPE ports are configured with the default spanning-tree behaviour. With the default behaviour, after being plugged, a switch port is temporarily put in a blocking state for 30 to 50 seconds, to acquire and calculate STP topology. If this behaviour is absolutely safe, some early network applications – like DHCP – will be subject to timeout. When plugging your first equipment, if your CPE uses a level 2 switch, and has « vlan » interfaces , the vlan management interface takes some time to toggle from down/down to up/up state. The DHCP server is bound to this interface, so it won’t be able to process a request until the associated vlan interface is in up/up state. I have screwed while flashing my Cisco device! Rommon tells me that it cannot find a bootable image. 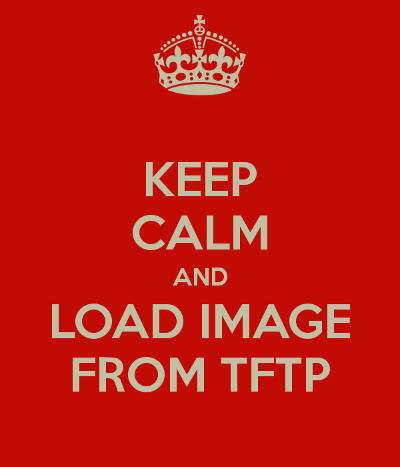 Once your image has booted, copy again your image from TFTP to flash, then check its integrity by computing and checking the resulting hash. Now, you can reboot safely and enjoy your fresh IOS image. I don’t remember my login/enable password, how to recover it? As the recovery procedures is model dependent, visit the Password Recovery Procedures web page where you will find the detailed instructions for your device.